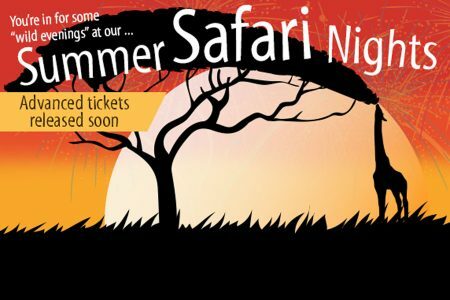 Safari Nights at Yorkshire Wildlife Park are selling out fast! Tickets have been flying as fans line up for magical evenings of music and fun at the innovative multi-award winning park. Safari Nights are a summer favourite when visitors can enjoy top bands, jugglers, magicians and fun workshops at the park, near Doncaster. TV presenter Michaela Strachan is also returning to YWP for another instalment of her Really Wild Show. The ever popular Safari Nights- running every Saturday during the Summer with last admission at 7.30pm – provide a unique opportunity to see some of the world’s rarest and most at risk animals after hours while enjoying top tribute acts, local artists as well as a bangless fireworks finale. The first evening proved an almighty success as a world famous One Direction tribute band headlined the show. YWP Director Cheryl Williams said: “The atmosphere is always brilliant at these nights. As well as the One Direction tribute, this Summer’s guests include Take That and Abba tribute bands, who will be joined by X-Factor finalist Jake Quickenden and Britain’s Got Talent violinist Alexandra Parker. There will also be live acoustic rock and soul sessions in The Courtyard between 4pm and 8pm every Safari Night. Meanwhile, children will be able to practice magic and have fun with jugglers and entertainers. Then at 8pm the headliners take to the stage with each evening completed with a spectacular bangless fireworks display accompanied by Britain’s Got Talent violinist Alexandra Parker on every night but the last one. Abba Revival – who topped the National Tribute Awards in 2013 – are the stars on August 1. The weekend of August 8 & 9 is a bumper attraction with Michaela Strachan at the park, at Branton, on both days and Take That Live! the headline on the Saturday night. The top acts keep rolling with X-Factor singer and I’m a Celebrity contestant Jake Quickenden, from Scunthorpe, performing on Saturday, August 15. Its another dose of Swedish tribute fun from Forever Abba who star on Saturday, August 22, with Jake Quickenden making a popular return on Saturday, August 29, with extra music from Elaine Huckle replacing Alexandra Parker during the fireworks. YWP gives a unique walk through experience bringing them almost face to face with some of the world’s most rare animals, including Amur Leopards, Giraffes, Painted Hunting Dogs along with Lions, Lemurs and Meerkats. YWP’s three new Amur Tiger cubs, born on March 29 and a significant step forward in the conservation of the species, are currently thrilling visitors when they step out into public while Polar Bears Victor and Pixel are enjoying their first Summer together at the ten acre Project Polar. Whatever the weather there is something to do at YWP. There is the Safari Village shopping centre and café, which can be accessed without having to enter the park. Then the weatherproof Monkey Play barn is the perfect place to warm up or stay out of the sun in the 120-seater eatery. Adults can relax whilst the children enjoy three levels of play equipment, including climbing frames, dens, slides and rope bridges in full view of the baboon reserve through the glass walls. For more updates on all the latest events and special offers, visit our events page.